Soft Chocolate Chip Cookies are ultra ooey and gooey with two secret ingredients to keep them ultra soft and tender! Your friends will LOVE these cookies. Click here to download my FREE cookie customization guide! Taste: This cookie has big butterscotch flavor and the small amount of cream cheese in the dough adds an almost indiscernible tang that takes these cookies over the top. Texture: Ultra soft and tender. Pros: Perfect for when you’re craving that super soft texture in a cookie. Would I make this again? I’ve been making this recipe for years. Today we’re talking all about making SOFT chocolate chip cookies. The kind that are ultra tender but still hold their shape and are loaded with tons of ooey gooey chocolate chips. If you haven’t noticed, I’m obsessed with chocolate chip cookies. But sometimes I crave different textures. Sometimes I want them to be super soft chocolate chip cookies. Yet other times I want them to be thin and crispy chocolate chip cookies. Don’t get me wrong, practically any homemade chocolate chip cookie is a good with me. It’s just every once in a while you have a texture craving that must be satisfied. Which texture of cookies do you prefer? Does your family love soft batch cookies? Chewy? Crispy? Some combination of it all?! There are a few key ingredients to ensure your cookies bake up ultra tender and soft. Brown sugar is hygroscopic, which means it takes in and retains moisture (better than granulated sugar). Adding moisture to your cookie dough can help make it softer and chewier, and stay soft for longer. That’s why I use way more brown sugar than granulated sugar in this recipe. Learn how to to DIY your own brown sugar and how to keep it soft in your pantry here. Cookies with cornstarch are ultra soft and often slightly gooey and paler in color. It can also aid in lift and height, as it is a thickening agent. Just be sure not to add too much extra cornstarch, otherwise your cookies will develop an almost glue-like pudding consistency. I find in this recipe 2 teaspoons is the Goldilocks measurement. Not only does cream cheese add richness and flavor, but it also tenderizes the cookies so they’re super soft, even slightly chewy, without being cakey due to the fat content. I know it’s a bit of a hassle to add in cream cheese here, but believe me it’s these small details that take your cookies from good to GREAT. Be sure to use full fat brick cream cheese, not cream cheese for spreading on bagels. 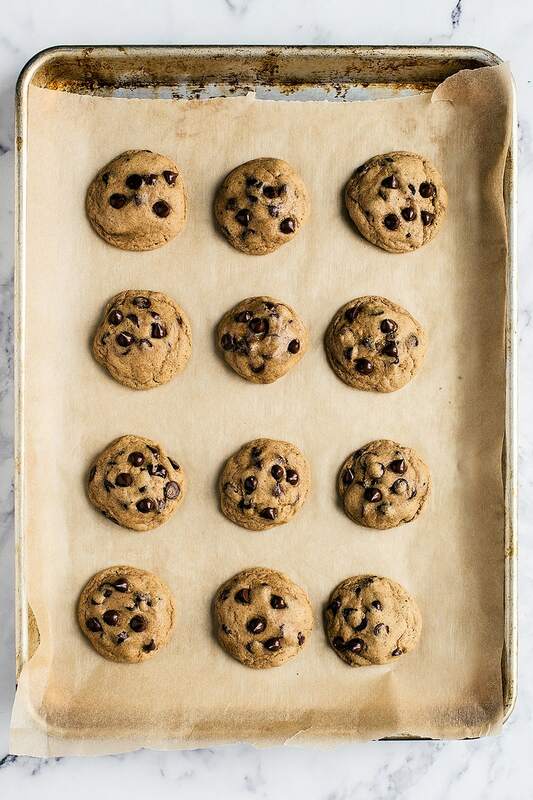 If your oven runs hot, you may want to reduce the temperature slightly to avoid overly browning these cookies. You want to remove these from the oven just before they actually look done baking. The residual heat will continue to cook them and they will solidify as they begin to cool. Also, avoid using a dark colored baking pan. The key to making sure your cookies bake up nice and thick instead of flattening into those little sad puddles is to make sure your butter and/or cookie dough isn’t too warm. Make sure your butter is at a COOL room temperature, about 67°F, before creaming with the sugar. Next, make sure your balls of cookie dough aren’t warm when they enter the oven otherwise the dough will melt too much. If you experience issues with your cookies spreading too much, try popping the tray of shaped dough into the freezer while the oven preheats. If you live in a very humid climate, try adding a couple extra tablespoons of flour to the dough to combat that added moisture. Download my FREE Cookie Customization Guide which shows you quick and easy ways to alter the texture of your favorite cookie recipes. 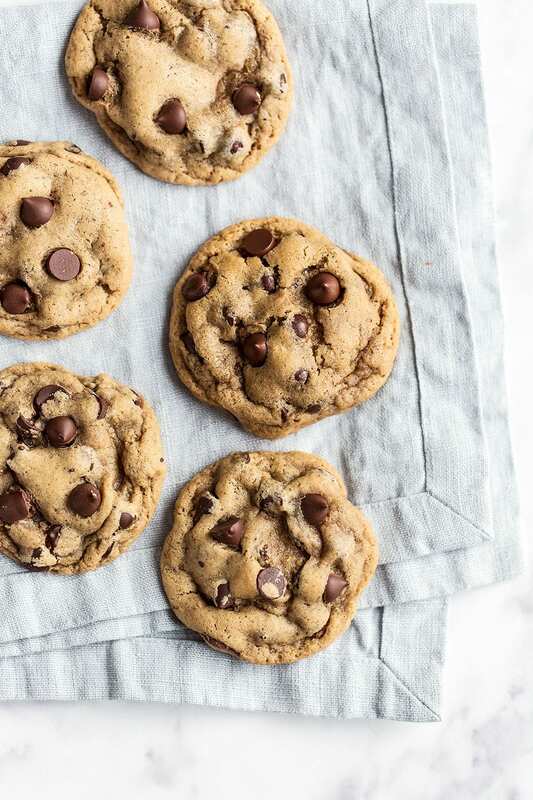 So whether you like soft cookies like this recipe, or prefer cakey, crispy, or chewy, this handy visual guide will show you what tweaks to make to get the texture of your dreams! See ALL of my chocolate chip cookie recipes here! In a medium bowl combine the flour, baking soda, baking powder, cornstarch, and salt. In the bowl of an electric mixer beat the butter, cream cheese, granulated sugar, and brown sugar until light and creamy, about 2 minutes. Add in the vanilla and the eggs, one at a time, beating well after each addition. Gradually beat in the flour mixture. Stir in the chocolate chips. If time permits: wrap dough in plastic wrap and refrigerate for at least 2 hours but no more than 72 hours. This allows the dough to “marinate” and for the final cookies to become softer, thicker, and more flavorful. Allow to come to room temperature before shaping. Divide dough into 2-tablespoon sized balls and drop onto prepared baking sheets. Bake for 10 to 11 minutes, or until light golden brown. Don’t over-bake. Cool for 2 minutes before removing to wire racks to cool completely. This recipe was originally published in 2013 and recently updated with new photos, weight measurements, and more recipe tips. Photos by Ashley McLaughlin. Can’t beat a good, classic chocolate chip cookie recipe. This one sounds incredible! Love the use of cream cheese in these! The texture looks perfect! I’m so intrigued by this recipe! I can tell it’s one of those I’m going to have to try soon! These soft chocolate chip cookies were the best I have had in any recipe! The texture was outstanding , I guess with the cornstarch and cream cheese in the recipe. They were 10 times better then Toll House recipe! 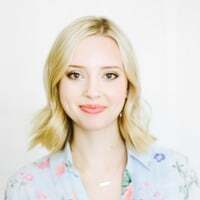 Thanks Tess So glad to be on your site! Everyone should try this recipe you won’t be sorry! I swear by cornstarch in cookies and it’s a must – have for me now in all choc chip cookies! I love softbatch-style cookies so much. Pinned! Oh and cream cheese too! Love the texture/flavor it adds! hi ya, so far so good, just wanted to point out that there is no direction on the vanilla. Typically you add it after the eggs, so that is what I will do, but you may want to add that into the recipe directions, thanks! Thanks for pointing that out – I fixed it. Thank you, thank you, thank you. I have been trying to get my chocolate chip cookies to have a more cake like appearance and not fall flat like a pancake. I have read countless blogs, professional baking sites, cookbooks etc. and it was not until I read your blog about your experiments with CC cookies and the different consistencies achieved, that i had to try the “more brown sugar” over granulated sugar a whirl. I read your blog this morning on this subject and this afternoon I baked. I used my CC cookie recipe but change the sugar consistency to 75% brown sugar and 25% granulated sugar. BULLS EYE! Right on the money. My husband and I are now please as we stuff our faces with these pouches of heaven. Thank you. I am a fan and follower now! I’m so so so happy to hear that!! FANTASTIC reipe! Definitely a keeper. I didn’t chill the dough as per recipe, and only did half to test my first batch. What I love about these cookies is how they continue to stay soft even after cooling which is not the case with other cookie recipes I have tried. I also like how there isn’t a butter after taste in my mouth. Wonderful. Thank you for sharing. Cannot wait to try these!! Can this recipe be cut in half?? I tried that recently with the Toll House and it did NOT work! My cookies were flat as a board. I don’t see why not! Esp since there are two eggs, that makes it a little easier. I made a half recipe of these and chilled the dough for about 12 hours before baking. I also used salted butter and organic unwashed sugar subbed in for the granulated sugar. My batch came out very slightly on the cakey side and the cookie part had a very mild flavor. The cookies remained nice and soft, even 12 hours after baking. I might try these again, but with baking soda as the only chemical leavener. I made these today and served them to my bridge group, No one could eat just one. They are everything you say they are. They are staying soft and are rich and wonderful. This is a keeper!!!! Wow! 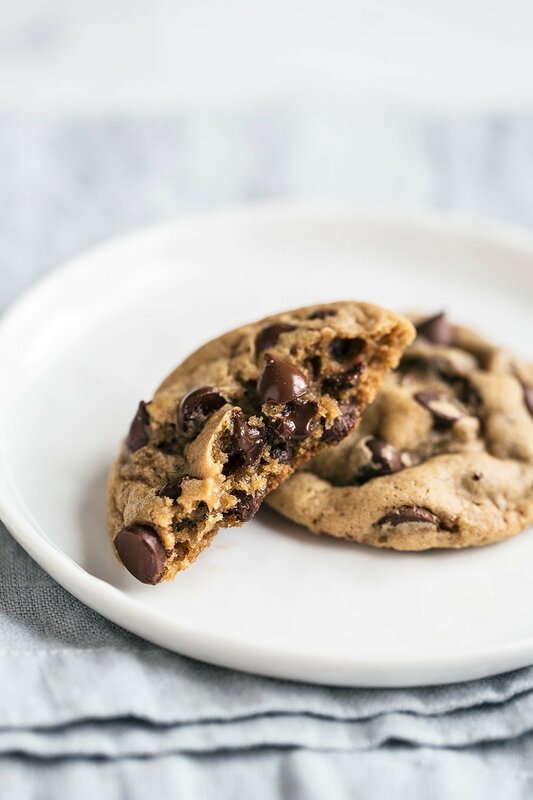 I’ve been searching for a better chocolate chip cookie recipe and I think I’ve found it! Thank you!! One tip – instead of chilling the dough and then scooping it (when it’s firm and harder to scoop), I lined a tray with parchment and used a #24 disher to scoop the just-made (and soft) dough into balls, placing them on the tray. I then popped that into the fridge to chill. Later, when it was time to bake, I simply transferred the chilled dough balls onto a baking sheet and popped them into the oven. The #24 disher is 2.67 Tbsp, so my cookies required a slightly longer baking time (12-13 minutes), and are a nice ample size (3.25″ in diameter). I am thrilled with this recipe! How many cookies (approx) does this recipe yield? I bake once a month for a homeless soup kitchen and was wondering how many batches I would need. Thank you, I can’t wait to try this recipe! 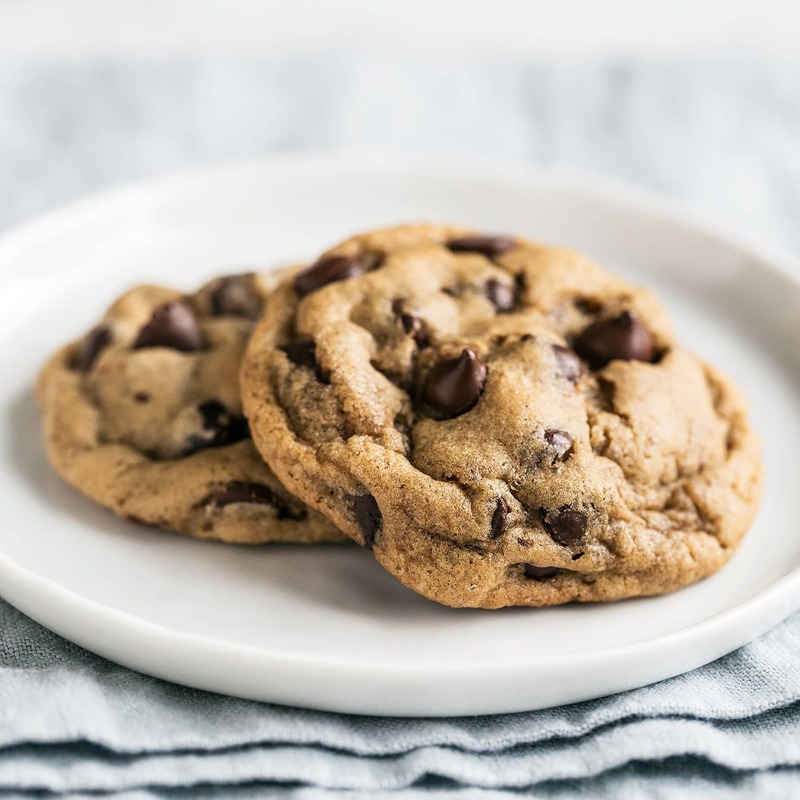 After many years of tinkering with the recipe on my own, I finally found the perfect chocolate chip cookie recipe – thank you!! I love all your posts..your experiments aree brilliant..learning alot…thanks for sharing.. The recipe calls for 1 1/2 sticks of unsalted butter. Is that 1/4 cup sticks or 1/2 sticks?? Not sure what you mean but 1 1/2 sticks = 6 ounces or 12 tablespoons. Thank you! That answers my question… These cookies are our family’s favorite!! Can you PLEASE write and actual measurement for the butter instead of “1 and 1/2 sticks?” Some companies package their butter differently, and remember people from outside of the country might use the recipe too. These cookies turned out SO well! I had to make about 20 dozen (yah, TWENTY) cookies for an event, so instead of chilling then scooping, I scooped the dough out onto waxed paper and froze them a a few days in advance, then bagged them up to store until I was ready to bake. From frozen I baked them for 12-13 minutes. Straight from the oven on Sunday afternoon, these just tasted like a fabulous chocolate chip cookie with a little crispy edge (which is my favorite)–I didn’t really get that soft batch texture. But then I stored the few that were leftover and had one this morning. HOLY CHOCOLATE, that cookie was exactly what a soft batch cookie should be! I’m not sure my hubby will want me to make any other kind of chocolate chip cookies again! Thanks for developing such a great recipe! Cant find cream cheese where I live… would I be able to use sour cream instead? I am so excited to try making these, sure I wont be disappointed! I made these cookies yesterday Sunday January 8,2017. They are fantastic. Soft and loaded with chips and chunks ( I used both). This am still soft and wonderful. I made 41 nice size cookies . Thanks for recipe. What adjustments would I need to make for high altitude? I live over 8,000 feet. Hey, can I use a mixture of 2tsp baking powder +1 teaspoon oil + 2 tablespoons water as replacement for each egg in this recipe? This is what I generally use as egg replacement. Hi, Tessa. Thank you for all your great recipes. I was wondering about how you test your recipes to see if they are good. I usually do a taste test on my family, with them saying whether it is good or bad. How do I get a more in depth analysis? Can you give me suggestions on how to analyse my recipes? I haven’t tried, but if you do let us know how it turns out! My daughter and I made these today and they’re wonderful, but I’m wondering about storage..do they need to be kept in the fridge because of the addition of cream cheese or are they ok kept out? And if so, for how long at most?